CAMversation: Who Gets to Interpret Race and Power? Join CAM Raleigh for an interactive panel discussion on interpretations of identity, race, and power in contemporary art. This event is inspired by contemporary artist, Margaret Bowland’s exhibition Painting the Roses Red curated by Dexter Wimberly and will be facilitated by Michael English from The Art of Cool project. From the series Painting the Roses Red: Isn't it Romantic? by Margaret Bowland. 2011. Oil on linen. 70"x50". Loan courtesy of Susan and Dennis Sullivan. 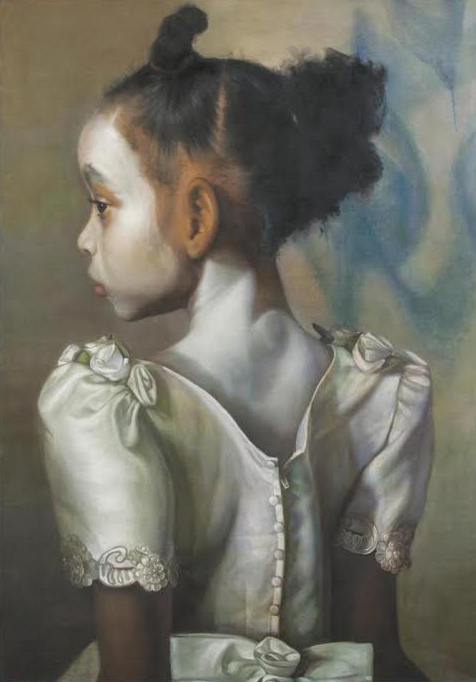 Born in 1953 in Burlington, North Carolina, Margaret Bowland's work confronts contemporary issues of race and identity. However, her technique is influenced by the deep tradition of European representation. Margaret Bowland is a graduate of the University of North Carolina at Chapel Hill. For more than 25 years, she has lived in Brooklyn, New York, where she also maintains her studio. Bowland has had a thriving career as a painter in oils and pastels, delving into personal and societal issues through portraiture and figurative compositions. "Margaret Bowland is searching for beauty, an eternal quality that she feels has been diminished and re-defined by consumer culture. Her works seek out difficult truths, evoking awe and discomfort as the artist’s perceptions challenge and deepen our own. She understands that art has the power to let both her models and viewers “exist apart” from the world’s limits," states Art History professor, John Seed, who recently interviewed Bowland for The Huffington Post. "When making works I have often covered my subject in paint. I feel that I am doing what the world does to my subjects - tries to obliterate them or turn them into people they are not. For me, the victory is that the people I paint stare back at you completely whole, completely themselves. No matter the costume or the make-up, you are looking at an individuated and very real, human being. They have, or are learning to survive through what the world has thrown at them," states Margaret Bowland. Learn more about Margaret Bowland here.